Today, dear brothers and sisters, we are celebrating the memory of the Holy Great-Martyr Demetrius of Thessalonica and asking his prayers for us before the Throne of God, before which he was found worthy to stand for his valiant struggles in confessing the Christian faith. This wondrous passion-bearer of Christ flourished at the end of the third century, when a terrible persecution was being leveled against Christians. He was born to noble and illustrious parents. His father, proconsul of the city of Thessalonica, was a secret Christian who kept icons of Christ the Savior and the Mother of God in his prayer room. He also taught the Christian faith to his only son, St. Demetrius, who guarded the faith until the very end of his life, when he sealed it with martyrdom. Following the death of the saint’s father, the Emperor Maximian appointed him proconsul of Thessalonica because of the saint’s nobility and courageousness of soul, ordering him at the same time to exterminate the Christians in this city. However, upon arriving in Thessalonica, St. Demetrius instead granted freedom to the Christians, openly confessing himself to be a Christian, which was then communicated to the king. When Maximian, stopping in Thessalonica upon his return from battle, learned that St. Demetrius was indeed a Christian, he removed him from his post as proconsul and ordered him imprisoned. Here, in prison, the passion-bearer was stabbed to death with spears. Thus, achieving a glorious and martyric end for his confession of Christian faith, he went to the Lord. Such is a brief account of his life and struggles. The words of the Gospel read in memory of the glorious Great-Martyr Demetrius now attract our attention, dear brothers and sisters. The Lord said to His disciples: These things I command you, that ye love one another. If the world hate you, ye know that it hated Me before it hated you. If ye were of the world, the world would love his own: but because ye are not of the world, but I have chosen you out of the world, therefore the world hateth you. Remember the word that I said unto you, The servant is not greater than the Lord. If they have persecuted Me, they will also persecute you: if they have kept My saying, they will keep yours also. But all these things will they do unto you for My name’s sake, because they know not Him that sent Me (John 15:17-21). 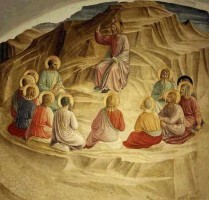 As we see, the Lord commands His disciples to have love amongst themselves, warning them that they will be persecuted by the world; they will be oppressed and hated by people who neither know nor accept the Lord Jesus Christ, Who became incarnate for our salvation, and by those who reject Him by their behavior. These are people who deny the future eternal life and love only this earth, which they view as their eternal habitation, supposing that they can find joy by catering to their passions. Heaven is an alien country to them; they do not recognize the Divine laws; they are guided by the customs of this world: the lust of the flesh, the lust of the eyes, and the pride of life (1 John 2:16). This is the world that hated Christ Himself then; now, too, it hates those who follow Christ with faithfulness. In the world ye shall have tribulation, says the Lord (John 16:33). The world and its people hate true followers of Christ because they do not join with them in their dark, wicked, and evil deeds. The life of a follower of Christ is not like that of a lover of the world: He was made to reprove our thoughts. He is grievous unto us even to behold: for his life is not like other men’s, his ways are of another fashion (Wisdom of Solomon 2:14-15). He is a thorn in their eyes; the world finds him completely intolerable, for which reason he is hated by the lovers of this world. 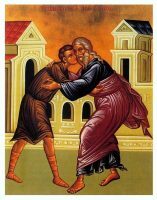 The world also hates the good because the Lord naturally sheds His great grace on good people sooner than on the impious; the righteous are therefore persecuted out of envy, as we see from the examples of many of the righteous of antiquity, such as the patriarch Isaac, the righteous Joseph, and many others. In view of this, the Lord commands us to love one another, to have mutual communion, and to have unity amongst ourselves. Love binds people together. We should extend our love to all our neighbors, beginning with our parents and relatives and ending with our detractors and enemies. The law of love is itself light and pleasant, for love is the loftiest of enjoyments. To live in love and harmony is man’s greatest happiness and blessedness. Love of neighbor sometimes requires certain sacrifices of us, since we are duty bound to serve our neighbors and to render them help in whatever way they need. These virtuous deeds for our neighbors then produce the purest enjoyment in loving hearts – even when our neighbors are our enemies. God is with them. We should not only love them, but do good to them and pray for them, for it is not they who do battle against us, but our common enemy: the devil. Through love for our neighbors, and by doing deeds of charity for them, the enemy is shamed and defeated. Loving our neighbors is not only not difficult, but even pleasant. But we do not always feel such love towards others. Feelings of self-love sometimes appear, which choke and kill our love of neighbor. The Lord, in commanding us to love our neighbors, gives us an image of the measure of this love. This measure is always with us: it is we ourselves. Let everyone look at himself: the amount of love you have for yourself is the same that you should have for your neighbor. Thou shalt love thy neighbor as thyself (Mark 12:31). Sometimes these words can be difficult for us. Our self-love says: “What?! Love others as ourselves? Make them equal to ourselves?” Yes! This is the will of God; this is the will of the saints and the righteous. By spurring ourselves to love our neighbors, we peer above all into our own nature. Are we not all brothers by nature and by faith? Do we not all have one God, one Savior, and one Holy Church? Are we all not baptized into one Baptism and do we not all commune from one Body and one Cup? Are we not all being prepared for one Heavenly Kingdom? Does not our Heavenly Father love and show mercy on us all? Our criminal self-love wants to be given sole preference, but God’s commandment to love our neighbors as ourselves prescribes us to have brotherly unity with all, to do to others what we wish for ourselves: Therefore all things whatsoever ye would that men should do to you, do ye even so to them (Matthew 7:12). Indeed, if we look at the religious life of humanity, and especially at that of the Christian Church, we see that here, as nowhere else, such brotherly unity is required; the very concept of mutual communion is extremely significant. The Church, by its very nature and calling, is a communion and union – a lofty, moral, spiritual union. Therefore mutual communion, unity, and love are the foundations of the Christian religious life. By this shall all men know that ye are My disciples, if ye have love one to another (John 13:35), said the Lord in his final, parting discourse with His disciples. Indeed, living unity and communion in mutual love have been the most distinguishing characteristics of Christian life in the best times of its development. The author of Acts writes the following about the first Christians in the Church of Jerusalem: And the multitude of them that believed were of one heart and of one soul: neither said any of them that ought of the things which he possessed was his own; but they had all things common… Neither was there any among them that lacked: for as many as were possessors of lands or houses sold them, and brought the prices of the things that were sold, And laid them down at the apostle’s feet: and distribution was made unto every man according as he had need (Acts 4:32, 34-35). This most perfect union of the first Christians is worthy of emulation: their unity of spirit and even of the external aspects of their life while surrounded by the Jewish and pagan society of the time, which was corrupt, depraved, and brutal, where everyone worked for his own advantage and strove to put pressure one another, with everyone stepping on everyone else. In the centuries of Christian history that followed the apostolic era, mutual love and communion among Christians was so profound that there was nothing like it in the pagan world of antiquity. The Christian Church then quickly spread throughout all cities and countries, but in every city the Church had a relatively small number of followers, surrounded on all sides by a myriad of unbelievers and pagans hostile to Christianity. Nonetheless, the members of the various Christian Churches spread throughout the world into different countries and peoples; constantly pursued by countless enemies and adversaries, they were like members of a single family, like brothers and sisters, as indeed they called one another in all sincerity and in the true sense of these words. The pastoral epistles of those times that have come down to us, which were often exchanged by people who had never seen each other face-to-face, breathe a spirit of intimacy, sincerity, and mutual trust and involvement that is exactly like that of the correspondence of members of a single family who have grown up together since childhood and who have long become accustomed to sharing their thoughts and feelings, joys and sorrows, amongst themselves. When some need or distress, such as hunger or persecution by unbelievers, arose in a particular Church, the members of the other Churches looked upon this affliction as their own, helping the afflicted as best they could. If famine arose in Jerusalem, those in Antioch hurried to provide assistance for the hungry. During the apostolic era, Christians in Macedonia sent help and support to Palestine on one side of the sea, and to Rome on the other. The pagans themselves were astonished by the love and intimacy they saw among Christians, not understanding the power that so united them in the bounds of love. By the example of their virtuous life, Christians transformed the moral foundations of the world of that time – solely by the spirit of their faith and the power of their love. Indeed: this is the victory that overcometh the world, even our faith – faith accompanied by love (1 John 5:4). Thus, love and mutual communion are the fundamental principles and essential qualities in the development of the religious life of Christianity. Without them it would be dead – for only love gives rise to all life. Therefore we, too, must take care to acquire love – which, according to St. Paul, is patient and kind; is not envious or boastful or arrogant or rude; does not insist on its own way; is not irritable or resentful; does not rejoice in wrongdoing, but rejoices in truth; bears all things, believes all things, hopes all things, and endures all things; and never ends (cf. 1 Corinthians 13:4-8). In the world to come, love will prevail among members of the Heavenly Kingdom. May the example of the holy martyrs – and of St. Demetrius the Great-Martyr, whom we honor today – who laid down their souls for their neighbors, also serve for us as models of true love of neighbor! May their example also inspire us to endure tribulations with courage and calm, knowing that we must through much tribulation enter into the kingdom of God (Acts 14:22)! Amen. Delivered on October 26 / November 8, 1960.